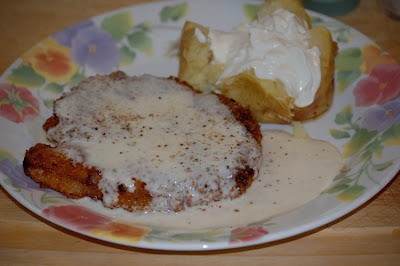 This was a challenge levied by one of my likers on Facebook to come up with a good chicken fried steak recipe... Challenge accepted. It had been literally over 20 years since I had eaten chick friend steak and even the mere mention of it conjures up thoughts of white haired Southern gentlemen in their seersucker suits and lapel pins sipping mint juleps on the verandah. Well it's not as bad as all that. It's certainly a recipe that goes back quite a bit but started out as a way of making use of tougher cuts of meat. I used sirloin when I made it and although it was good, I think if I do it again I'd make use of the more traditional round steak. The key to an awesome crispness is the double dip coating method and of course the meal is not complete without the gravy. Far from being the nasty wallpaper paste gravy found in so called Southern restaurants, this is a creamy bechamel, the original incarnation of White Sauce. Take your steak and trim off any hard gristle and cut into 4 pieces. Place a piece on plastic wrap and cover with plastic and tenderize with the pointy side of a meat mallet until 1/4" thick. Repeat with all pieces. In a bowl mix coating ingredients with a whisk until well blended. In separate bowl whisk eggs and milk gently until blended. Pour about 1 Cup panko into pie plate. Coat each steak in the following manner, 1) Flour, 2) Egg dip, 3) flour again, 4) egg dip again, 5) panko. Place on a platter when done. Heat 1/4" crisco or lard in heavy frying pan until hot and shimmery. Cook steaks 2 at a time, 3-4 minutes on first side (until blood can be seen seeping through top) and 4-5 minutes on other side. Place on wire rack over newspaper to drain. Serve with Bechamel Sauce (click for recipe).